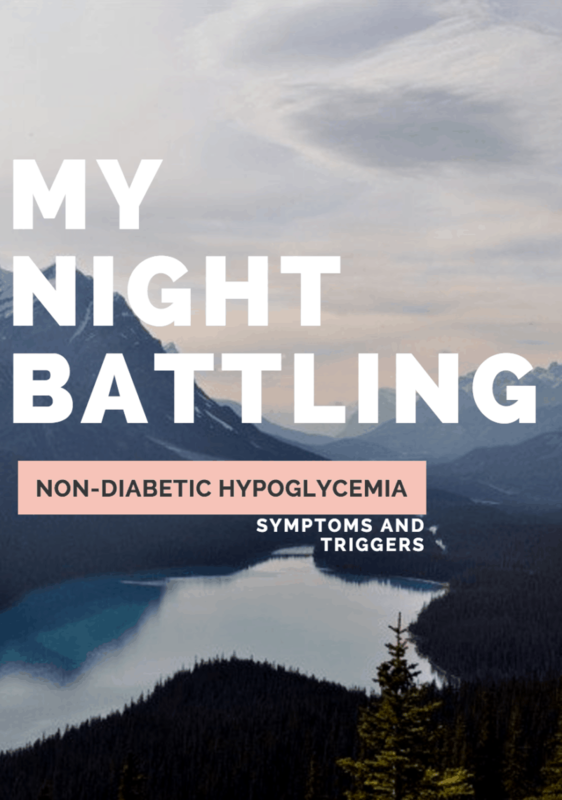 An inside look at what a Non-diabetic Hypoglycemia attack looks and feels like from someone who recently experienced an attack. Last night, I had an episode that was truly frightening. After doing a little research, my husband and I figured out that it was non-diabetic hypoglycemia. I have never experienced anything like that before and I hope it never happens again. I want to explain everything that happened to me before the event and during. This way, you can look out for similar symptoms should you ever feel out of whack yourself. There are some truths about Non-diabetic Hypoglycemia that I just didn’t know, but a quick online search helped me make sense of the absolute chaos I went through while out with friends. First, I want to give you a summation of my day before the onset to paint you a picture. I’m not someone who drinks a lot of coffee, but yesterday I had a Medium Iced Vanilla coffee with milk and sugar from Dunkin Donuts. Shortly after, I went to Starbucks and got a Trenta Black Tea Lemonade. Add those two together and keep track of the caffeine and sugar I consumed – keep it in your back pocket. For dinner, I had Japanese noodles and vegetables. No protein. It wasn’t my healthiest of days. I have to point that out because your diet can truly bring on Non-diabetic Hypoglycemia. Low carbs and refined carbs would have been better choices!!! But knowledge comes when you LOOK BACK at your mistakes, right? Anyway, after all that junk, I headed to a tap dancing class and had a really good workout. It was the first time that I ever tried something like that and I actually worked up quite a sweat. I didn’t think it would be possible, but all those “ball, shuffle, chain, hops” really did me in. Once we finished the class, my friends and I went out to get a drink and I had a Hard Apple Cider. Here’s we go — are you ready? Actually, before we take one more step, I want to tell you that I have Hashimoto’s disease and while it’s not full blown hypothyroidism… my endocrinologist tests me every few months for the triggers because we are simply waiting for it to manifest in my body. Hashimoto’s is a precursor to Hypo. So, there it is — my entire backstory before the attack. We were all out and a friend of mine, Marianna, started to talk about a recent party that I had at my house. She started referencing a friend of mine – one that lives a few doors down from me and one that I’ve known for almost ten years. I couldn’t remember her. At all. Marianna thought I was kidding. She kept asking me about Liz Smith. That’s not her real name but we will leave it at that. For the life of me, I couldn’t remember her. I couldn’t remember knowing anyone by the name of Liz. I couldn’t remember having a friend that lives on my block (there are several friends that live on my block). I couldn’t plug into what she was saying at all. Then I got nauseous – immediately. For a split second, I thought to myself that I must be drunk! But with only one Hard Apple Cider in me, I couldn’t see how that was possible. But there I was – unable to remember an important person in my life and feeling nauseous. I joked with Marianna and said I was drunk and asked her to forgive me, but secretly I was scared. Then I began to sweat. Mind you, this all happened within a minute or two. It all revved up pretty quickly. I got very hot and dizzy and I began to sweat all over my body. I had to sit down immediately. My other friends noticed at that point that I wasn’t well and offered me some water. I thought I was going to throw up on everyone, so I asked Marianna to take me home and we left right away. As soon as I left the bar, a gust of cold air hit my skin and I felt better. Liz Smith! Of course! How could I possibly not know who she was? As soon as I left the bar, I remembered everything about my block and the friends that I had and the party at my house. It all came back – almost as if the lights turned on. I was no longer nauseous and I was no longer sweating. I was completely fine. When I tell you that the shift was physical, you have to believe me. Here’s another little tidbit about me that I don’t really tell anyone or talk about except to my husband. 3 out of 4 grandparents of mine died with Alzheimers and two had Dementia. I am literally tearing up writing this section because if you were to ask me what my deepest, darkest fear was… it is this. I forget words. I pull at words. My family knows to not help me when I struggle to find simple nouns. They let me fumble through the thought in my brain until I get there on my own. It’s funny to think that I do this considering I do so much public speaking and TV, but this is a REAL TRUTH in my life. Fridge escapes me. I know it’s there. I see the item. I feel it at the tip of my tongue, but it’s like my brain cannot connect with my thought. Several times a day this happens to me. It’s getting worse as I age. I am aware of the condition and it scares me. I beg Bill when we are quiet and in bed to never put me in a home and forget about me when I go full blown Alzheimers. He promises never to leave me and it comforts me to hear it. You cannot get deeper into my soul than what I am telling you. SO, when I was at the bar and I couldn’t remember a PERSON or a BLOCK OF PEOPLE or a PARTY that I just had… it was as if my nightmare was coming to life. It had happened. I had lost my mind. My soul had disconnected from me for an instant and I felt what it was going to be like 30+ years from now. Maybe that’s why I got nauseous? It was too much to take in. I’m telling you this because I will never repeat that day’s behaviors again. I will never place myself in a situation where I had too much caffeine and carbs and not enough protein and water and then overexert myself through exercise. I will never scare myself again into hysterics because it’s all I’m thinking about this morning. I’m already going to live that life… I refuse to start at 39. Here are a few bullets I found online that are symptoms and triggers. I forgot to mention that I had pregestational diabetes with one of my children and have several family members who are currently diabetic. It runs in my family. Needless to say, it was a scary night. I feel quite numb this morning and am actually working from my bed while still in my PJs. I don’t think I am going to move from this spot. Today is going to be a day of rest and renewal. I know it’s not a second chance, but it sure feels like that considering my fears of the future. I was pulled out and then back into reality for just a split second and it shook me at my core. How many times do I have to hear that diet and exercise is key to a healthy life? How many times do I have to hear to start taking care of this vessel because it’s the only one I got? How many more years will I take for granted before someone irreversible happens? Love yourself and your body. Listen to yourself and your body. Have you experienced anything like this before? I feel like I have to go to the doctor and get a blood test to figure things out?